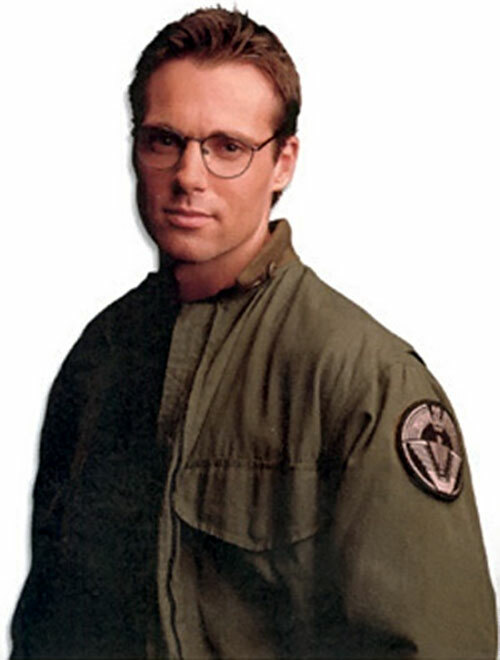 Daniel Jackson was one of the core characters of the Stargate SG-1 TV show. 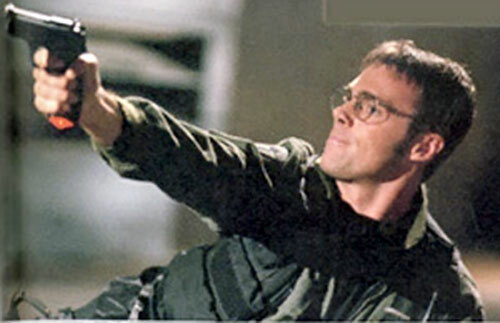 SG-1 was one of the main genre shows of the turn of the century, running from 1997 to 2007. It depicted the adventure of an elite military unit operating alien technology capable of instantly travelling to other worlds. The show has 10 seasons, two movies, and was a spin-off from the original, 1994 Stargate movie. 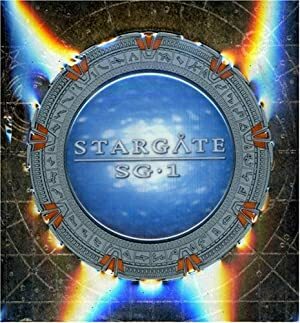 This profile covers the first eight seasons of Stargate SG-1. It includes some S P O I L E R S for those seasons. Real Name: Daniel Jackson, Ph.D. Known Relatives: Sha’re (wife, deceased), Claire Jackson (mother, deceased), Melburn Jackson (father, deceased), Nicholas Ballard (grandfather, deceased). Group Affiliation: Stargate Command, SG-1. Base Of Operations: Stargate Command, Cheyenne Mountain, WY. Height: 6’0” Weight: ~170 lbs Age: 40. Daniel Jackson was kind of a maverick within the academic community. This is not to say that he is incompetent – far from it ! Just that he doesn’t necessarily follow the same paths as the rest of the community. He is a brilliant anthropologist and linguist, speaking more than 20 languages. He also is very clever, often seeing ramifications that others simply do not. His ability to see things that others don’t almost cost him all credibility when he presented a theory that the pyramids of Egypt might be far older than anyone suspected. That is, until Dr. Catherine Langford heard about his theory and introduced him to the Stargate program. Dr. Langford promised Dr. Jackson that, working on the program, Dr. Jackson would be able to pursue his theories, no matter how radical they might seem to the academics and scientists on the outside. He would be given the freedom to follow them through to whatever conclusion to which they might point. It was more than he could pass up. Shortly after joining the program, Dr. Jackson was able to translate the coverstones to the Stargate. This provided the key to actually getting the device to work. Thus, he joined the expedition led by Colonel Jack O’Neill on the first mission through the Stargate, to Abydos. On Abydos, the expeditionary team found a population of humans. They had been enslaved by the Goa’uld System Lord Ra. Jackson and the military forces in the expedition helped incite a revolt and fought and destroyed Ra’s forces, including his command ship. When the expeditionary team returned to Earth, Daniel chose to remain on Abydos with Sha’re, who was to become his wife. When the Goa’uld System Lord Apophis invaded Earth a year later, Colonel O’Neill returned to Abydos to retrieve Dr. Jackson. He hoped that the scientist’s knowledge might help them find a way to repel Apophis’ attack. Once there, he discovered that Dr. Jackson had been studying a map on Abydos. It revealed the locations of a great many other systems containing Stargates. During the same mission, Apophis and his forces came through the Abydonian Stargate. They kidnapped Sha’re and her brother Skaara. With this, Dr. Jackson returned to Earth to help the fight against Apophis in earnest so that he might somehow recover his wife. Daniel joined Stargate team SG-1 and followed Apophis to the planet Chulak. There he and SG-1 discovered that Sha’re and Skaara had been implanted with Goa‘ulds. He encountered her several subsequent times over the next few years, but was never able to save her and remove the Goa‘uld inside her. Eventually, Sha’re was killed by Daniel’s SG-1 teammate Teal’c, former First Prime of Apophis and defector to the SG-1 team. This was necessary to save Daniel’s life. Later, SG-1 began to encounter information about a race of Ancients. Dr. Jackson believed that these were the architects of the Stargates. After several moments of contact with the Ancients, Dr. Jackson was killed following a radiation accident on the planet Kelowna. But this was not the end. Instead of death, Daniel was given the opportunity to join the Ancients, but he would have to cease any contact with his living friends. Daniel proved to be a maverick in this arena, too. He appeared to members of SG-1 on several occasions to give them advice, in blatant defiance of the Ancients’ rules. Daniel has since mysteriously returned to the living, albeit with a case of amnesia regarding his time while ascended. He has rejoined SG-1. 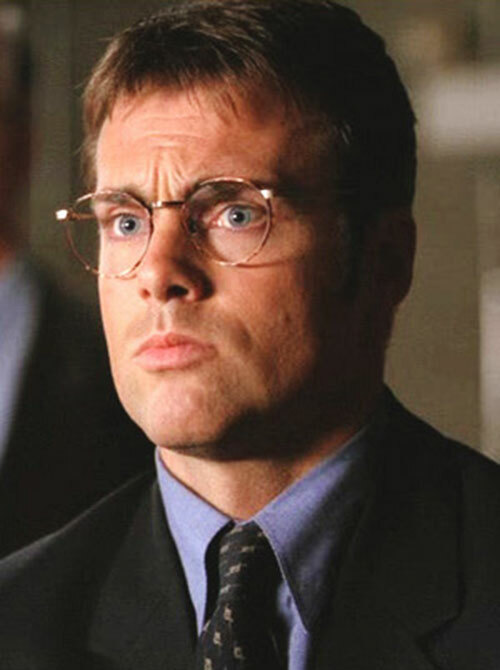 Daniel Jackson is a bookishly-handsome White male in fit condition with piercing blue eyes. His most frequent facial expression is one of quiet evaluation of his surroundings, consistent with his analytic mindset. 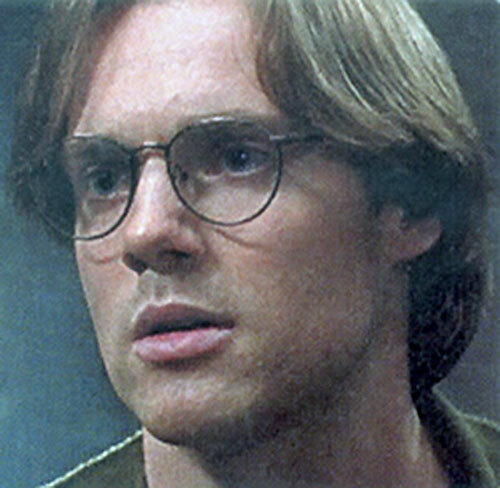 He had long hair when he first joined the SGC, but the active lifestyle of SG-1’s missions eventually encouraged him to adopt a much shorter haircut. He sometimes wears glasses, but his eyesight probably only needs minor correction. He frequently works without them, without notable hindrance. While on-duty with SG-1, Daniel wears the same garb as the military contingent of the SGC. That means olive green BDUs with a black utility vest in the field, and dark blue or olive green fatigues on base. Outside of work, Daniel wears the comfortable garb of a researcher used to working in the field. That usually means blue jeans or slacks and comfortable loose button-up shirts. When making appearances at formal events or when meeting with off-world dignitaries, Daniel dresses in a tweed suit. But he doesn’t wear a tie unless the occasion is very important. Daniel’s life has been driven by the thrill of discovery. His thirst for knowledge gained him prestige as a gifted prodigy during his early academic career. However, that same impetus made him a figure of ridicule among the academic and archaeological community when he pursued his theories of well-developed complex cultures existing long before the commonly-believed dates for the beginnings of human civilization. He persisted regardless, confident in the strength of his theories. And Jackson found vindication beyond his wildest dreams when he was brought into the Stargate program. Throughout it all, he evinced neither bitterness over the disdain of his colleagues nor petty self-congratulation when his ideas were proven true. He simply pursued his theories with determination and delighted in the new discoveries that he made. Daniel’s appreciation for other cultures has reinforced his strong humanitarian values. Whenever possible, he seeks out the most diplomatic solution to any problem he is facing. He values establishing and maintaining good relationships with other cultures over other potential advantages such as advanced technology. Daniel’s alternative approach to problem solving is often just as important to the successful resolution of SG-1 missions as his extensive knowledge of ancient languages and societies is. Another benefit of this instinct to build bridges between communities is the high regard in which Daniel is held by numerous pacifist societies. Most notably the Tollan and the Nox. Though Daniel has a pacifist bent, he will not hesitate to use force if necessary to protect himself or others. As such, Daniel has learned basic military protocols such as hazmat procedures and combat skills such as pistol marksmanship. He’s even used covert operation skills to work undercover in some rare instances. Daniel is usually restrained and thoughtful when he expresses himself. This belies the depth of Daniel’s emotions, which he will only show in private or when he thinks its necessary to convince someone else of how serious he is with respect to a particular subject. Daniel’s ability to comport himself with dignity and calm in stressful circumstances even helps others maintain their own composure. On the other hand, it also sometimes makes his social interactions with others slightly awkward, especially in sensitive situations. Jackson meets O’Neill’s frequent and sometimes inappropriate jocularity with great patience. This in turn shows his own sense of humor and dry wit. Because of the pain that the Goa’uld have caused him and so many others, Daniel tends to be uncharacteristically aggressive when dealing with them during field missions. During one mission on a Goa’uld world, Daniel took an extra moment to destroy a creche of Goa‘uld larvae. That was even though it wasn’t necessary to complete his task. Even so, he is still quite capable of maintaining his usual cool-headed demeanor when meeting with Goa’uld in diplomatic settings. Unlike most popular depictions of scientists working with soldiers, Daniel usually gets along very well with Colonel O’Neill. While he is willing to take great personal risks in order to gain more knowledge of the world, he recognizes and respects that O’Neill’s priority is to safeguard the people around him. In return, O’Neill does his best to give Daniel room to work. Because of this understanding, Jackson and O’Neill have managed to maintain a strong friendship and a very productive working relationship. This is despite numerous vociferous disagreements on the proper course of action in ethically questionable situations. The interplay between Daniel’s morality and Jack’s pragmatism formed the balanced core of the team’s personality. Thus, SG-1 struggled to maintain that equilibrium in Jackson’s absence during his ascension. 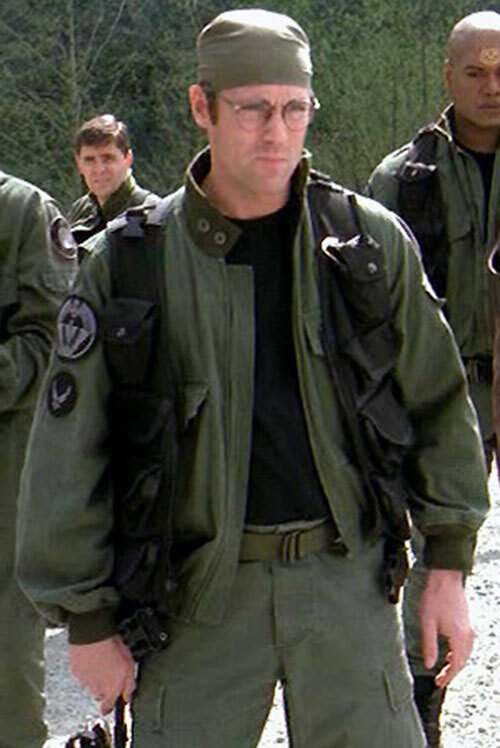 Jackson’s connections with the rest of the team are just as strong as his friendship with O’Neill, though not as complicated. Jackson’s and Carter’s specialties are very different, but they take a common delight in new discoveries, and have a mutual appreciation of each other’s strength of character. Their similar temperaments have made them in many ways as close as siblings. Teal’c and Daniel share a very stoic bearing. More importanly, both men have lost much to the Goa’uld. They have quietly supported each other in dealing with those losses. When Daniel first joined SG-1, his primary goal was to rescue his wife. Otherwise, he would have been happy to stay on Abydos, studying the ruins there for the rest of his days. Although he worked hard on his missions to gather new information for the SGC, finding Sha’re was never far from his mind. Thus, he would detour without hesitation if he thought he’d found a way to get her back. 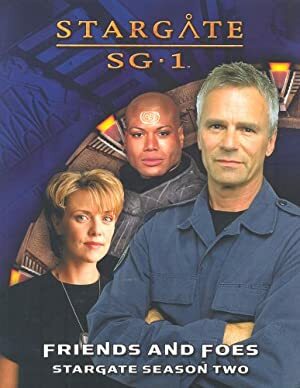 After her death, Daniel stayed with the SGC to save others from the Goa‘uld as well to continue expanding his knowledge of human cultures throughout the galaxy. Area knowledge (Abydos), Credentials (Special (SGC)), Confined Headquarters (office in SGC), Expertise (“Ancients”), Iron Nerves, Languages (“Ancient,” Arabic, Aztec, Cuneiform, Egyptian, Farsi, French, German, Goa’uld/Linear A, Greek, Incan, Latin, Mayan, Russian, Spanish, Viking futhorc, Atanik, Dutch, Middle English, Unas (limited vocabulary)), Omni-Language, Scholar (Ancient Earth Civilizations, Archaeology, Earth History, Earth Mythology, Earth Religion, Egyptology, Goa’uld, Languages and Linguistics), Sharp Eye. Asgard (Low), (High), General Hammond (High), Nox (Low), People of Abydos (High), SG-1 (High), Tok’ra (Low). Previously had a High Connection with Dr. Catherine Langford – who is now deceased. Serious Irrational Attraction (problem solving / puzzles). Beretta 92 [BODY 04, Projectile weapons: 04, Ammo: 15, R#02]. FN-P90 Personal Defense Weapon [BODY 04, Projectile weapons: 06, Sharpness (projectile weapons): 01, Ammo: 12, R#02, Advantage : Autofire, Limitation : Can ony use SLAP ammunition (already factored in)]. Zat’nikatel (“Zat”) [BODY 04, Lightning: 06, Disintegration: 08, Limitations: initially the Zat may only Attack with Lightning for Bashing damage; if the same target is Attacked again within four Phases (2 APs) of a successful hit (i.e., an attack earning positive RAPs), then the Attack must use Lightning for Lethal damage. If the same target is attacked yet again within four Phases of the Lethal Lightning Attack, the Attack must use Disintegration]. By Eric Langendorff and Roy Cowan. Helper(s): Sébastien Andrivet, Daniel Ream, AEG Stargate Role-Playing Game, www.scifi.com , www.imdb.com . Source of Character: Stargate movie and Stargate SG-1.